70 years ago in Soave, in the Nuj area, they were growing red-wine grapes. So we decided to plant our Merlot, Cabernet Franc and Cabernet Sauvignon vines in the same place which is the source of this wine aged for 22-24 months in small barrels. It is the perfect combination of fruit, spices and the wind that blows in Castelcerino. From our own hillside vineyards in the “Nuj” area of Castelcerino, in the heart of the historic Soave Classico zone. The vineyard lies at 150 meters (492 feet) above sea level, with a south-southwest exposition. “Nuj” has a certain austerity of style. 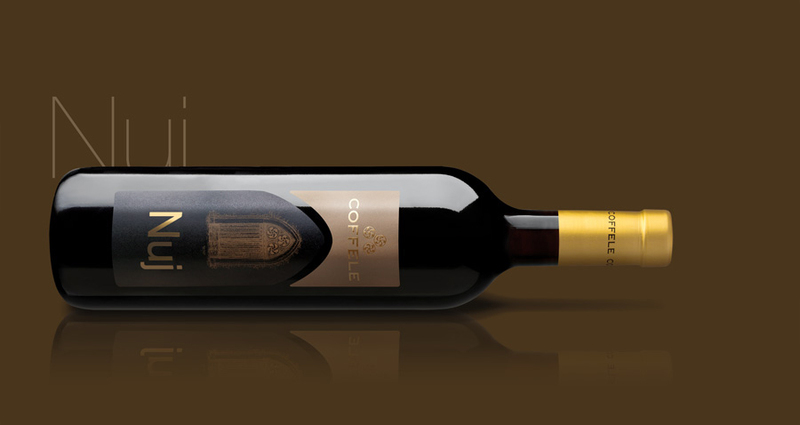 It is highly structured, harmonious, and delicate, with a long finish. The refreshing acidity balances out the wine’s alcohol, and the tannins are dense yet fine. The fruit comes from a 1.25 ha (3.1 acre) vineyard, with vines trained using vertical shoot positioning (VSP) and planted at a density of 6250 vines/ha (2500 vines/acre). The Merlot is harvested completely by hand; we let it hang just slightly late and bring it in almost at the same time as the Cabernet Sauvignon. After crushing and destemming, we ferment the must for about 12 days at 30-32˚C (86-90˚F), then leave the wine to macerate on the skins for about 10 days. “Nuj” then matures in 225L oak barrels for 24 months. The wine takes its name from the toponym “Nuj” (pronounced “noo-ee”) found on an old 1847 map belonging to the winery. It seems that this dialect word means noi – that is, us – and it is to all of us, together, that we wish to dedicate this wine. Uncork the bottle one hour before serving. “Nuj” is rich and powerful, and demands fine food. It is best with fine meats, game, and aged cheeses. Deep ruby tinged with violet when young. Full of fruit: sour black cherries, blackberries, and ripe red cherries, with hints of balsam and spice and the slightest suggestion of herbaceousness. The aroma is rich and intense, but with great finesse. 5,83 g/l of tartaric acid.